There are at least 14 unique aspects of the Double Road Race. Our grand champion is the person who post the best age-graded performance - man or woman. 40% of all prize money is awarded to runners forty plus. The winner of the 10k leg wears a yellow jersey during the 5k so everyone knows who is leading. We are the only running event with a halftime. "There is something very special about the Double Road Race," says Christine Kennedy. You have to experience the Double Road Race to know what we are talking about. 2. HALFTIME: Double Racing® is the only running event with a halftime. For the Double 15k, the 5k leg of the race begins 105 minutes (1:45) after the 10k leg, which means runners may have up to 75 minutes to rest, recover and prepare to finish. 3. YELLOW JERSEY: The Male and Female winner of the first leg wins the Yellow Jersey that is given to them to wear during the second leg (for everyone to knows who is leading after the first leg). 4. 40% PRIZE MONEY FOR MASTERS: We give the opportunity for everyone to win and be rewarded. About 40% of the prize money will go to men and women runners over 40. 5. GRAND CHAMPION BEST AGE-GRADED: Grand Champion trophy (Double Victory Cup) is awarded to the best age-graded performance (man or woman) for the Double 15k according to WMA standards. Cash prize is equal to the same amount awarded to first male and female overall. 6. DOUBLE SIDED MEDAL FOR TOP FIVE PER 5-YEAR AGE GROUP: Unique medal is awarded to top five men and women in each five-year age-group from 14 and under to 75 years plus. The medal is awarded baced on your performance. 7 . ALL FINISHERS WIN AT THE DOUBLE: All Double Road Race finishers earn a commemorative unique Double Sided Finishers medal and a special full color program. 8. BENEFITS YOUTH RUNNING: All Doubles benefit Just Run, a youth running organization that combats chilhood obesity and related illnesses. 100% of all donations collected are given to a charity. At each location we will also stage the Bob Anderson's Kids Cup Double 1.5 Mile to directly help promote youth running. 9. ANYONE CAN PARTICIPATE: Runner's of all abilities can participate in Double Racing®. It is a doable challenge. 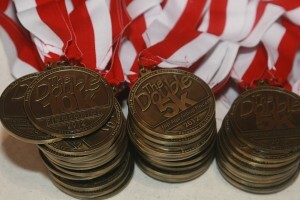 If you are not ready to run our Double 15k, start off with the UjENA Double 5K Run/Walk which is held at many Doubles. All Doubles are directed by runners for runners. Each director has been hand picked by the Double Road Race Federation for the best interests of the participants. The runner always come first. 10. 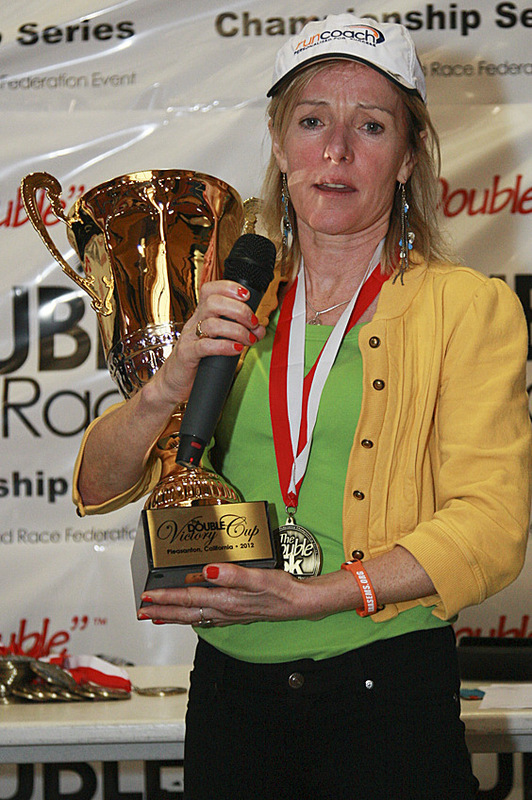 WORLD CLASS EVENT: Double Racing® is a professional and an amateur sport combined. Elite runners along with recreational runners will be participating together. 11. RECORDS AND STATS: Double Road Race Federation aka Double Running and Racing Federation will maintain records, stats, results and all Doubles will be staged following the rules and regulations established by the DRRF. World records and world age-group bests will be ratified by the DRRF. 12. AT LEAST $50,000 IN PRIZE MONEY: At least $3,000 of prize money will be awarded at each Double. $10,000 of prize money will be awarded to our Leader Board winners annually. 13. DOUBLE POINT SYSTEM: Every season, which begins in Pleasanton, California at the end of December, runners accumulate points on the Leader Board based on their performances at each Double race during the season. 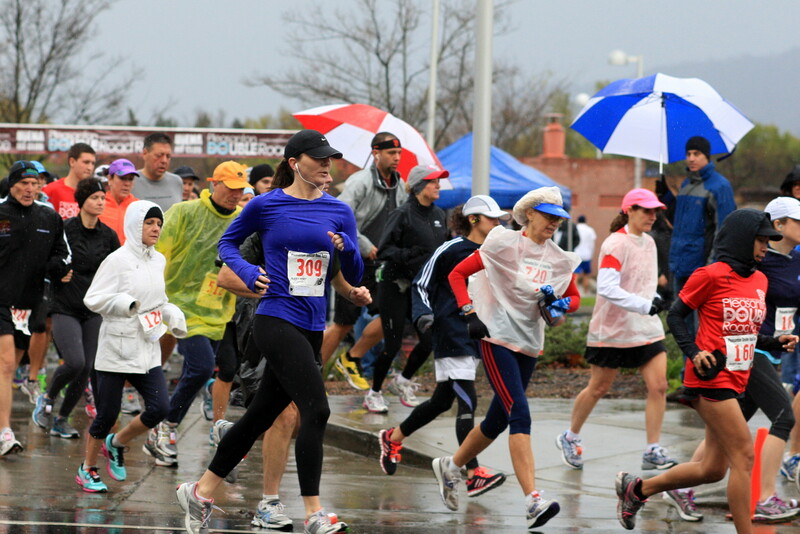 $10,000 of cash prizes will be awarded to the top ten men and women for our Double Road Race® 15k Challenge season. 14. THE RECOVERY ZONE: Double Racing® Halftime is not only a rest period for runners. The Double Road Race is the only running event that hosts a Recovery Zone where runners are exposed to various forms of healing and bodywork as well as nutrition and hydration to help them recover and prepare for their performance. This exciting attraction held at each Double will provide runners with an invigorating experience not found at any other running event.